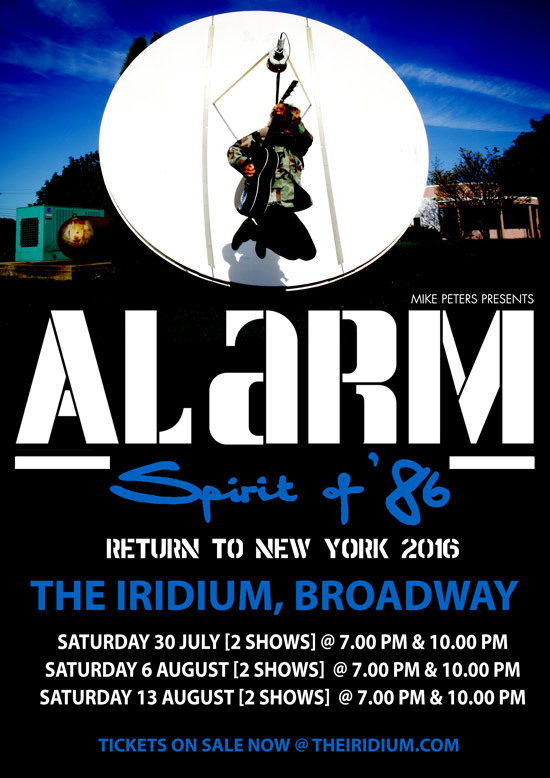 This Saturday will see Mike Peters present The Alarm – Spirit Of ’86 at The Iridium on Broadway, New York for the start of a three night, six concert stand in the city. All shows will take place across 3 Saturday nights starting this Saturday July 30th and continuing on August 6th and 16th with early and late shows at both 7.00PM and 10.00 PM. No two shows will be alike, as Mike Peters continues to surprise and excite fans of all eras of the band’s career, through unique and explosive electro-acoustic one man band representations of classic ‘Alarm’ songs alongside intimate acoustic performances of emotion and drama. 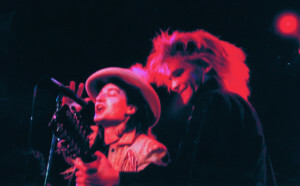 This will be the third year running that Mike Peters has hosted a summer residency at the Iridium on Broadway, and the event has now become an essential date in the calendar for Alarm fans who have been known to travel to NYC from all over the USA and Canada, along with visitors from the UK, Europe, Australia and Japan. 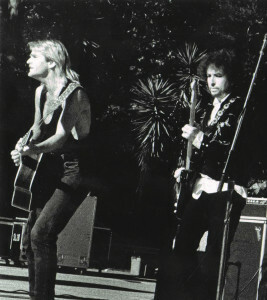 Celebrating 30 years since the original ‘Spirit Of ’86’ concert was beamed around the world, Mike Peters and all of us at thealarm.com look forward to seeing you on Broadway. 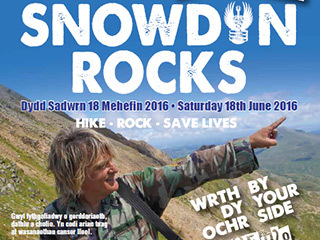 Become a part of the ‘Spirit Of ’86 in 2016’ Tour with Mike Peters. 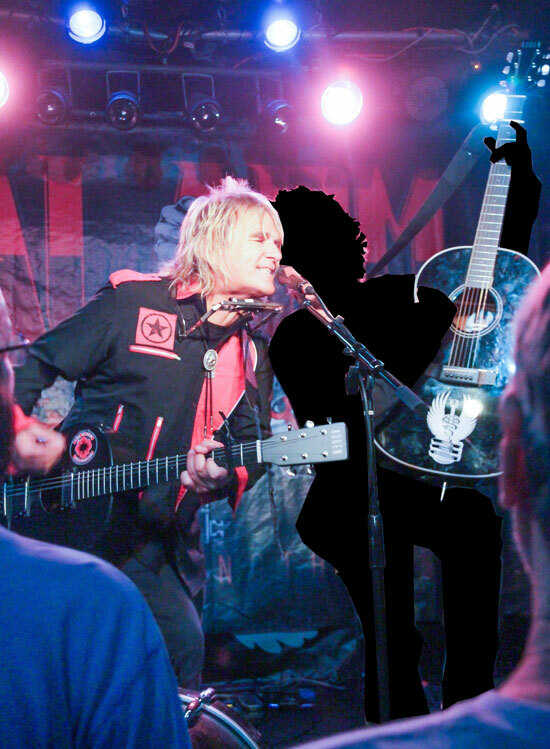 Mike Peters is offering Alarm fans the chance to perform during the show as special guest members of The Alarm, by bidding for the opportunity to join in the encore of ‘Knockin’ On Heaven’s Door’. The auction site is open now with bids starting from $86 per night per show. This incredible once in lifetime opportunity will allow successful applicants into the dressing room and on to the stage, to perform alongside Mike Peters and walk in the footsteps of artists such as Bob Dylan and Bono who have both duetted ‘Heaven’s Door’ with Mike Peters. 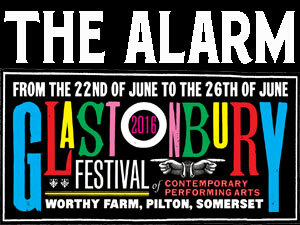 Successful entrants will be invited on to the stage during the encore, to become honorary ‘one night only’ members of The Alarm. Play and appear on stage with Mike Peters during ‘Knocking On Heaven’s Door’, (The winner will be able to play guitar, tambourine or your very own instrument that you can bring with you. The chords are easy (G-C -Am-G-C-D), and if you cannot play an instrument then you can always sing backup vocals!). Photograph backstage with Mike Peters prior to the show (Bring your own camera / video recorder to capture the event). Certificate of authentication to validate that you played an official part during the Mike Peters presents The Alarm – Spirit Of ’86 in 2016 North American Tour. A final donation from the proceeds will be made to the Love Hope Strength Foundation mission of Saving Lives – One Concert at a Time. Please note that the bidding for each performance will close 48 hours before the show and winners must also have a valid concert ticket to take part. Winners will be notified by email and payment will need to be received before the event. Good luck – happy bidding and looking forward to seeing you in New York.